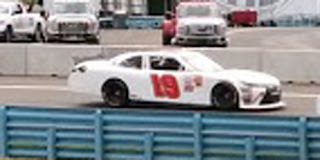 Jeff Green picked up the 72nd last-place finish of his NASCAR XFINITY Series career in Saturday’s Zippo 200 at the Glen at Watkins Glen International when his unsponsored #19 TriStar Motorsports Toyota fell out with a vibration after he completed 3 of the race’s 82 laps. With the finish, Green’s 12th of the season and 8th in the last 10 XFINITY races, Green has become the first driver in NASCAR history to finish last in 5 consecutive races in the same series. Green breaks his own record of 4 in a row set in August 2011 and matched last week at Iowa. The finish occurred in Green’s 407th series start. On Saturday, the 40th starting spot belonged to John Wes Townley, whose crew had to make changes to his #25 Zaxby’s Chevrolet after mechanical issues prevented him from completing a single qualifying lap. Though already starting in the back, Townley was thus listed as one of three drivers sent to the rear for post-qualifying adjustments, joining Ben Rhodes in JR Motorsports’ #88 Alpha Energy Solutions Chevrolet and the #40 Racing With Jesus / Courtney Construction Chevrolet of Morgan Shepherd. Shepherd was originally the lone DNQ in his #89, but the veteran was brought back into the field after the misfortunes of the Motorsports Business Management team. 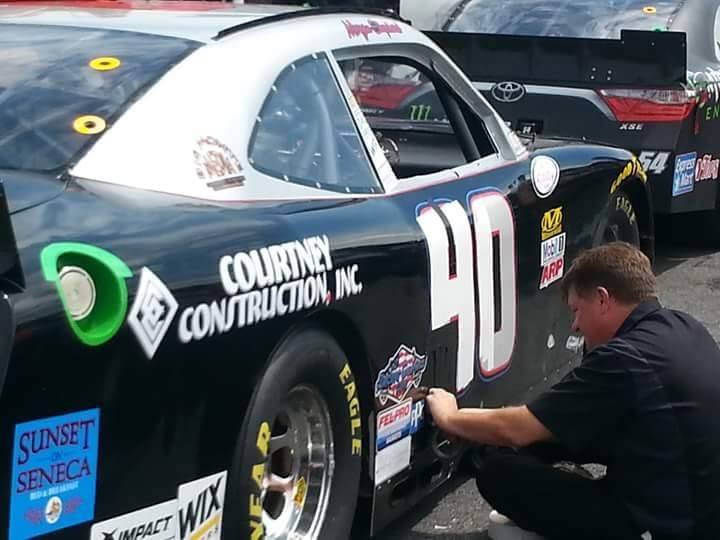 MBM’s #40 Braille Battery / Grafoid Toyota was originally entered with Josh Reaume, but after a 40th-fastest speed in final practice, Reaume was replaced by T.J. Bell for qualifying. Unfortunately, Bell lost the engine coming into Turn 1. With the race barely two hours away and MBM without a backup engine, the team arranged with Shepherd to drive the #89 as MBM’s “backup,” the car hastily renumbered with silver and black tape so it resembled a crude #40. Shepherd’s ride was ready just in time to follow Townley and Rhodes to the green flag. Meanwhile, Green was holding station in the 32nd position on Lap 2 when he began to fall back through the field to make his way to pit road. On Lap 4, he was all by himself, 70 seconds behind the field, when the lead Penske duo of Brad Keselowski and Joey Logano caught up to him entering Turn 11. Green held the inside as the leaders went side-by-side and cut hard to the right to get out of the way, narrowly avoiding a collision. The move not only captured the Green on camera, but also allowed Keselowski to take the lead from Logano, the first of nine lead changes before Logano finally prevailed. Green claimed the record-breaking finish by 5 laps over Townley, whose electrical problems resurfaced with a fire that stopped him at the entrance of Turn 1, bringing out the first caution. Shepherd’s re-numbered car parked soon after the Lap 13 restart. Rounding out the Bottom Five were two of JD Motorsports’ three entries, both felled with mechanical issues. K&N Pro Series West driver Michael Self came home 40th when his #0 Auto Remote Warehouse Chevrolet broke the transmission and stopped in Turn 1. Moments later, teammate Landon Cassill lost the engine on the #01 Great Outdoors RV Superstore Chevrolet as he exited Turn 10 and narrowly made it to pit road. *This marks Green’s first last-place finish in an XFINITY Series race at Watkins Glen since 2011, when his #44 TriStar Motorsports Chevrolet lost the brakes after he completed 1 lap. That finish was the second in his first streak of four lasts in a row. *The #19 had never before finished last in an XFINITY Series race at Watkins Glen. Thanks for the awesome write up as always Brock. However, T.J. Bell blew the engine going into Turn 1 in qualifying, no contact was made with the outside wall. Thank you. Do you have a link or video about Bell's qualifying problems? I was only able to dig up a photo of the car losing it in Turn 1 and a report the car was "unable to be repaired." Here you go Brock, thanks again for all your hard work, love reading this every week! Thank you, too. I will make the appropriate correction. Did you know you can create short urls with AdFly and get dollars from every click on your short links.